In order to go about our task, use the following steps to help you finish the project. 1. Pick a season to focus on. 2. Find out which months that season happens in the Northern Hemisphere (north of the equator) and in the Southern Hemisphere (south of the equator). 3. 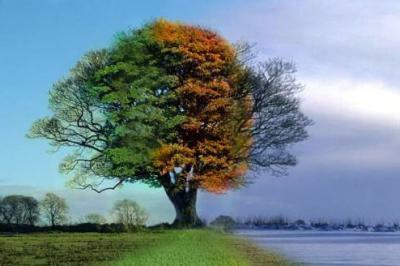 Find out what causes the seasons and why they change. Using the information above along with the worksheets to construct a poster neatly displaying this information with colorful illustrations. See the poster requirements on the rubric and handout. Description: The picture shows how the suns rays hit the northern hemispheres at different times in the year. Description: For this animation, look at the different months and how the sun's rays hit the Earth. If the sun's rays hit the Earth at more of an angle, they are not as strong. Look to see when the suns rays hit Michigan most directly, and when they hit Michigan least directly. Description: Interact with this animation. See how the tilt of the Earth affects the temperature of the Earth. 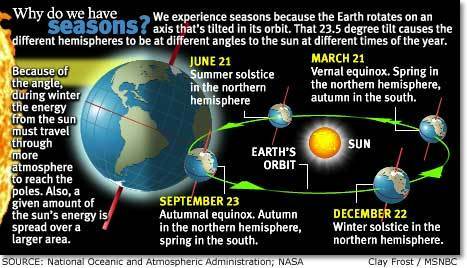 Then see when the seasons happen when the angle is at 24 degrees. Description: See the changes in temperature for the different cities listed. Click on each city for it to show up on the Earth. Change the months to see when it is summer for Australia, and Summer for Illinois. Description: Answers why summer days are longer and winter days are shorter. See if you can answer the questions on the bottom. Description: Pictures that show how the sun's rays come at different angles in the different seasons. Description: An example of how tilt affects seasons. Description: See how sunlight hits the earth as it rotates.